I have been getting compliments and offers to buy this rug from me for the last two years!! It's a beautiful rug that brightens my apartment and people love it!! 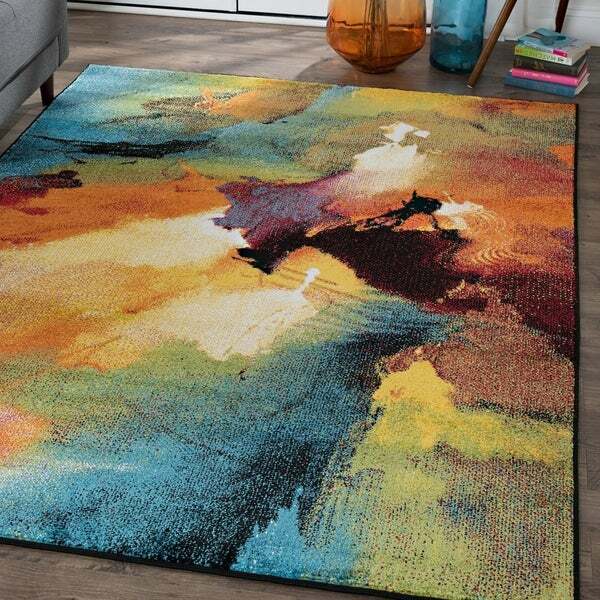 Add an artistic flair to any style with this contemporary area rug. This pattern has a stimulating watercolor effect in a wash of bright hues. Tangerine, deep aqua, crimson, canary, bright green, black, white, and taupe. Exact Rug Size: 7'10'' x 10'3'' / 123 in. x 94 in. Dimensions 123.0 In. X 94.0 In. X 0.44 In. Colors are bright and the rug lights up the room! Love it! Love this rug! Super colorful and soft! Love this carpet. We purchased the large one for our living room and it brings the entire room to life. We have contemporary furniture and it compliments the look. One important thing is to brush the carpet fibers in a direction that adds richness to the colors. What a difference We did not order a carpet mat as we wanted it flat since we have a small child learning to crawl and walk. We are very happy with it. I was a little worried that this would not be a nice as it looks in the picture, but it is wonderful. The colors are bright and add just the perfect pop of color. Also very soft on the feet. I was in awe when I first saw this rug and it hasn’t failed to disappoint. Great colors, matches all the different colored furniture and art in the room and helps tie it all together. Got lots of complements on it at recent party, especially paired with the red sofa. Safavieh Galaxy Watercolor Vintage Blue/ Multi Rug - 5'-3" X 7'-6"